AUSTIN — The Texas Community Music Festival was blessed again with beautiful, cool and sunny weather Tuesday evening at Central Market North, with contrasting sounds and consistently great entertainment. Ky Hote and the Celtic Stronghold led off and delighted the crowd, which demanded encores, with a mix of what they described as “Texas Celtic” music. 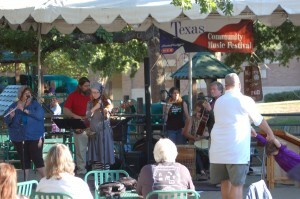 Included in the ensemble was a performance on the rare hammer dulcimer, a first for TCMF. The evening continued with the first Austin performance of the new Austin Swing Orchestra, who had the audience jumping all the way to closing time. Tonight, TCMF moves to The Park at The Triangle for performances by the New Austin Polka Band and Austin Brass Band. The show returns to Central Market Saturday morning. Check the schedule page for details.